I have provided an update on our wild horse rescues below, but I am also excited to provide a link to a Youtube video that was produced for us by a group of people who love the wild horses as much as we do and also WHOAS’s work to help them. This past Saturday, WHOAS, was again fortunate enough to have a team of veterinarians out to our site to finish the gelding process for the rest of our young boys. Everything went extremely smooth and the last five boys that were to be gelded came through their operation in great shape. 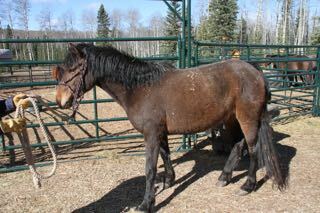 The only youngster not gelded yet is little Romeo who we want to get in better shape and put on more weight before he is done. We believe this little boy lost his mom last winter and yet survived through the rest of the year, ending up captured this February. He showed signs of not having gained enough proper nutrition in order to fill out his body when we rescued him. He is responding so very well now, putting on weight and is so cute as he follows you around the pen as it is cleaned just to see what these humans are up to. We know that our little ugly duckling will turn out to be a beautiful horse. Each young boy is led into our chute first where he can be safely sedated by the vets. Once sedated the patient is led down to the pen where he will be operated on and then allowed to recover. The whole time they are kept under observation by a WHOAS volunteer and regularly checked by the veterinarian. 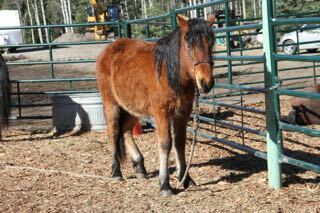 Here is young Aries who has gained his feet, but still is a a little wobbly. Each of the boys who is gelded also have their wolf teeth removed are given their 4 way vaccine and dewormed. The gentling process that all of our horses go through plays an important role in allowing all of this to happen without incident. Before the horse gets to this point though, no matter their age, they can be led throughout the pens and into their stalls in the barn. This also keeps them calm and secure as everything is happening to them. 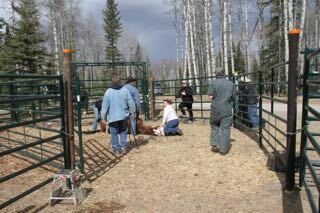 Our volunteers have done a wonderful job in assuring that the horses are taken care of. 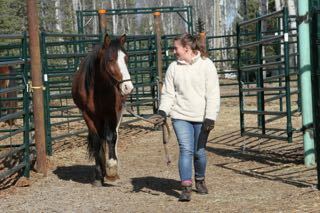 Here is a young student, visiting from England, who joined in to help out with the daily chores, including leading the horses to water and then back to their pens for breakfast. 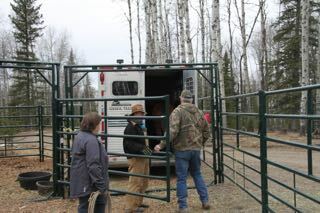 With our gentling process and getting all of the horses in our care taught to being led and put into stalls at night, has greatly helped when it comes time to load them into a trailer to travel to their new home. From the smallest to the biggest all have loaded extremely well and with absolutely minimal fuss. 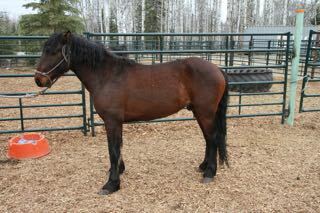 As of today we are still awaiting the arrival of their new owners and 4 that are still up for adoption. 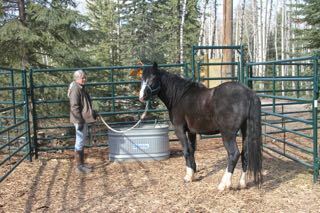 Here the beautiful 5 year old Louie is led to water. 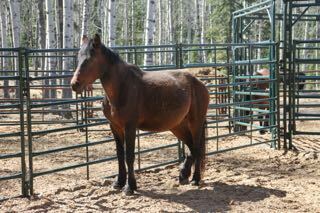 He is our most talkative boy and is always whineying out to the other horses or the resident herd when they come to visit our site. 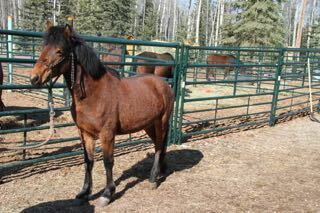 Of the four horses we have left up for adoption we have a 3 year old, “Curly” whom we thought had a new home, but his perspective new owner has not gotten back to us at all and so we will put him back on our list of horses for adoption. He is a beautiful young boy, very attentive and intelligent in how he perceives everything going on around him. 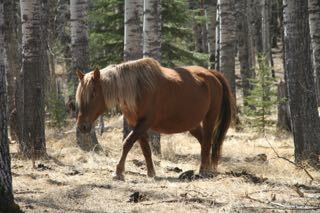 Then we have the 2 year old “Sheva” who is quite spirited and is responding well as we get to spend more time with her. 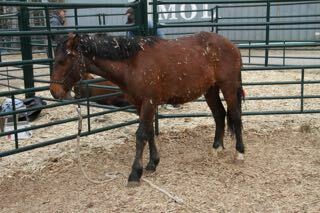 The we have “Penny” a yearling filly who has yet to have someone pick her as an adoption. She is a fantastic young girl, curious and again gorgeous. Of course there is also “Romeo” who is pictured above. 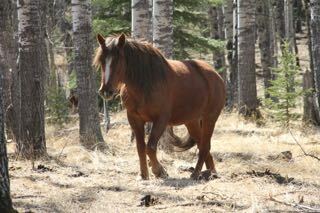 Along with these wildies we still have our two pregnant mares who are getting close to term for their foaling. We now have them in separate pens in order to give them sufficient room to become a mom. 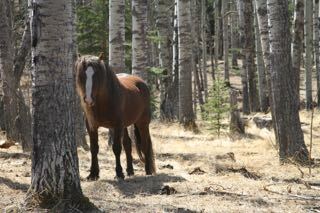 “Queenie” the 5 year old mare is still very shy of us, but that is okay as we do not want to cause her any stress. 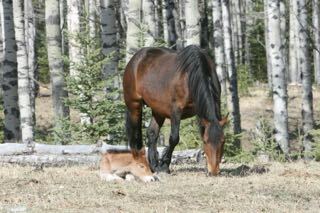 “Princess” the younger mare is doing well, but is becoming very uncomfortable as her foal moves into position within her. 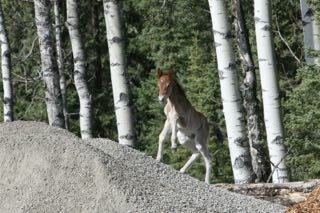 Then we have our resident herd, where three of the wildies are pregnant and should also be foaling soon. They will be doing it out in the woods, but we will keep track of everyone to assure that all is okay. The one mare who is not pregnant, “Mystery”, is amazing to watch. When one of the other mares shows signs of discomfort or such, she will go over to them, whinny softly and then nudge their tummy. 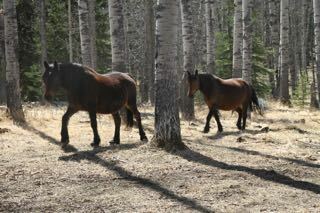 Aren’t these wild horses wonderful!!!!! Well….I just had a read and watched the new video, and now I sit here, the tears streaming down my face. What and incredibly lovely and heartfelt way this videographer and team has captured what you all do, and what these horses mean. A true artist and lovely compassionate soul. I am moved beyond words….especially having the good fortune to have been to the sanctuary several times, to know you all and to have believed in you all these many years. You are, each and every one of you, a real blessing to these horses and to the world we all belong to. Words cannot possibly express how I feel. 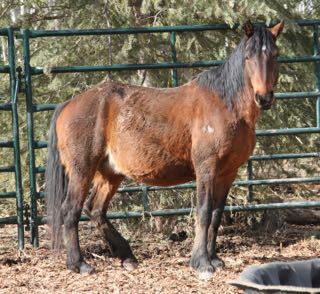 I really enjoyed the video…great job everyone…hopefully no more wildhorses will end up at slaughter…the Alberta government has to stop selling horse capture permits…thanks for your vision,compassion and dedication to saving them Bob..